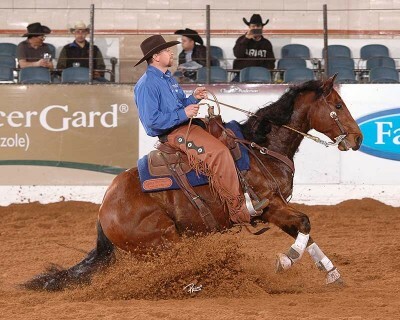 The Limited Open Bridle Reserve World Champion was Genuine Chic Pleaser (Chic Please x Miss Shiner Dear x Shining Spark), shown by Matt Kelly for Wagonhound Land and Livestock, a NRCHA Breeder Sponsor. Kelly piloted Geniune Chic Pleaser to a 431 composite (214.5 rein/216.5 cow). Kelly collected $2,275 and some great prizes: a Gist buckle sponsored by Smart Boons/Kevin & Sydney Knight; Rios of Mercedes boots sponsored by Rios of Mercedes; a notebook from Classic Equine and a World Finals jacket sponsored by Gardiner Quarter Horses and Merial.